Reading an old magazine is akin to unlocking a time capsule. You see the first draft of history before specifics are lost and/or second-thoughts have crept in. Which is why, in the late ‘80s and early ‘90s, I began to pick up (select) old copies of magazines wherever I found them – usually, though, at the Book Trader on South Street in Philly. 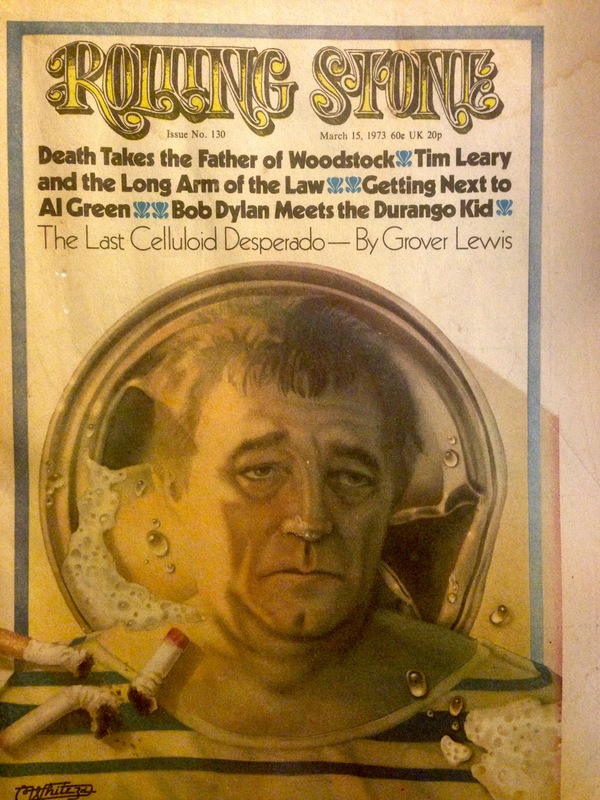 The store was a mammoth vault that housed dusty treasures, from used books to used vinyl to old magazines, such as this particular issue of Rolling Stone, which sports a cover date of March 15, 1973. At the time, the magazine was printed on slightly thicker-than-newspaper paper and folded in fourths, as the picture below shows. It was headquartered in San Francisco, and considered counterculture – rock music as a whole was generally counterculture. The cover story is of Robert Mitchum. There’s a long article on Timothy Leary; a remembrance of the “landlord of the Woodstock Nation,” Max Yasgur, who’d recently passed away; a “crazy” Ben Fong Torres profile of Al Green; and a Chet Flippo piece on Bob Dylan’s experience in Mexico shooting Pat Garrett & Billy the Kid with Sam Peckinpah, James Coburn and Kris Kristofferson. I acquired the LP – the sleeve held together with masking tape – from my father, who brought it home from a low-watt FM station that he helped run for the Raytheon compound in Jeddah, Saudi Arabia, where we lived at the time. It was a way to bring a touch of home to a decidedly foreign (and strange) land. Censors and customs officials sanitized and/or confiscated anything that might be construed as controversial; I remember my parents reading news magazines with blacked-out articles. In the Desert Kingdom, freedom wasn’t just a word for nothing left to lose; freedom, simply put, was forbidden. This issue of Rolling Stone, in other words, would have been confiscated – or entirely blacked out. 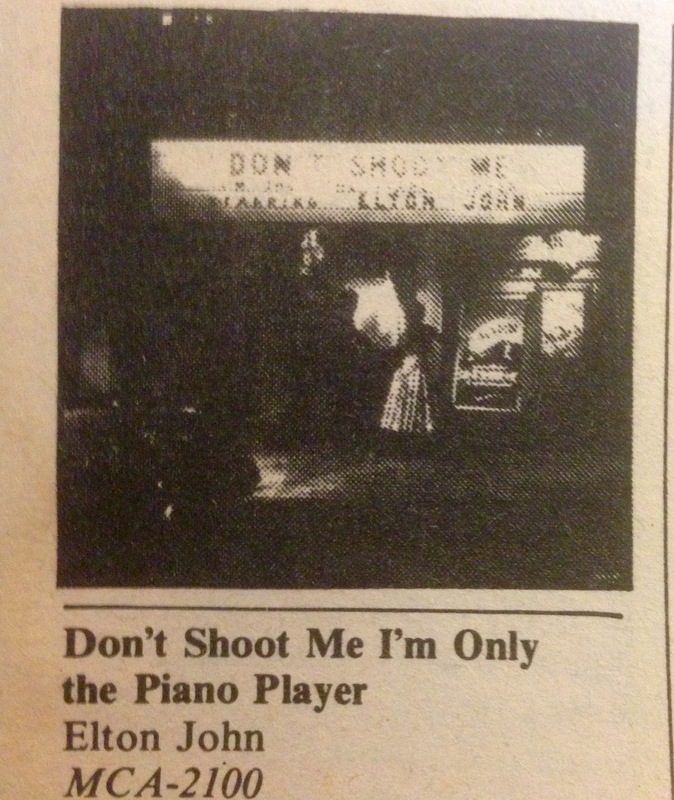 Which leads to today’s Top 5: March 1973 (via Rolling Stone). 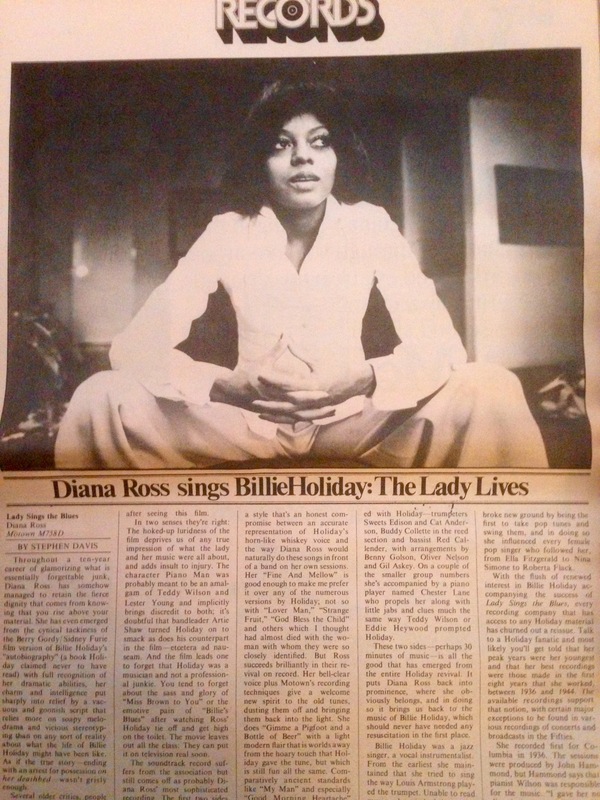 1) Diana Ross – “Good Morning Heartache.” Rolling Stone writer Stephen Davis – who would go on to author Hammer of the Gods: The Led Zeppelin Saga and other rock bios – begins his review of the Lady Sings the Blues soundtrack with a tone-deaf take on Diana’s hit-laden resume: “Throughout a ten-year career of glamorizing what is essentially forgettable junk, Diana Ross has somehow managed to retain the fierce dignity that comes from knowing that you rise above your material.” He then goes on to trash the movie and first half of the double-LP set, which features “snatches of trenchant dialogue, guaranteed to bring back the drear of the film, interspersed with minute-long segments of songs and Michael Legrand’s always tawdry, kitsch-laden ‘love themes.’” But, he says, the second half of the set, which features Diana’s full-length versions of Billie Holiday classics, “succeeds brilliantly…Comparatively ancient standards like ‘My Man’ and ‘Good Morning Heartache’ come off as Ross’ finest recordings.” There’s much to take issue with in his assessment, of course, as Ross (with and without the Supremes) released a string of stellar singles and albums in the 10 years prior to the film, but I’ll leave that for another day. This is a song and album I may well have heard right about the time of the review, though I can’t say for sure; it may have been a few – or more – months later. 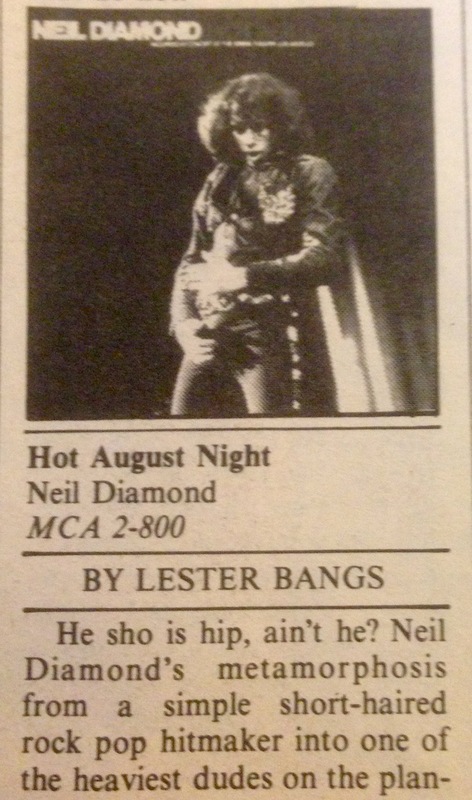 My parents were Neil fans, we had several of his albums, and I recall them playing this, which we had on cassette, quite often. 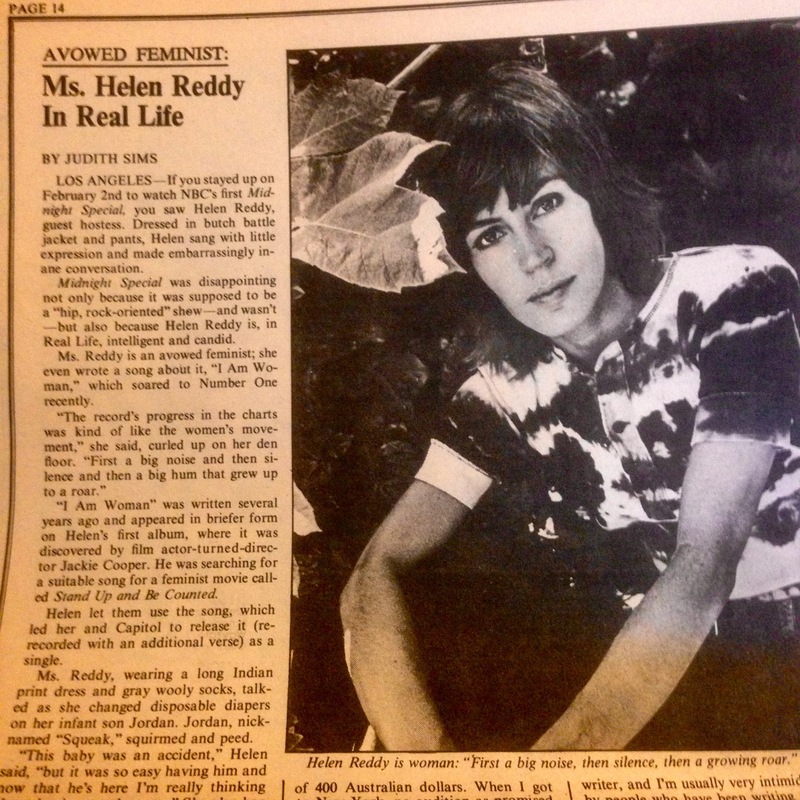 4) Helen Reddy – “I Am Woman.” One of the more interesting aspects of this 42-year-old music magazine is the lack of female artists spotlighted in its pages. Oh, sure, above I singled out Diana Ross and the Lady Sings the Blues soundtrack but, believe it or not, it was only one of two reviews of an album by a woman. The other was Yoko Ono’s Approximately Infinite Universe. The rest of the magazine follows suit. Bette Midler is mentioned briefly in a Ralph Gleason thought piece on the coming Next Big Thing; and, on page 14, there’s a decent-sized article about Helen Reddy, who’d just hosted The Midnight Special. “Dressed in butch battle jacket and pants, Helen sang with little expression and made embarrassingly inane conversation,” the article begins, before expanding to explain that she was an avowed feminist and intelligent, too; and that “I Am Woman,” which hit No. 1 in late 1972, wasn’t actually new, but a few years old. Its use in the end credits of Stand Up and Be Counted, a comedy film released in mid-1972, spurred its success. 5) The Spinners – “Could It Be I’m Falling in Love.” Another interesting aspect of this issue: the lack of black artists featured within its pages. Just as there were many worthy and overlooked female artists of the era, there were many black acts that just didn’t get the (white) press they deserved. 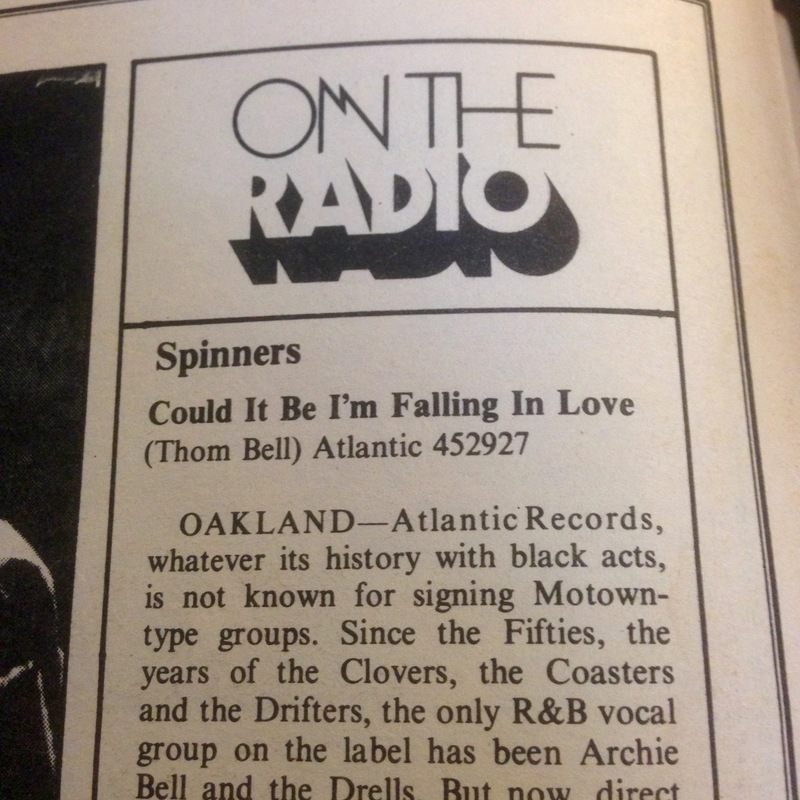 The Al Green piece was short; and this article on the Spinners was even shorter. Still, it explains how they toiled in the shadows at Motown for a decade before jumping to Atlantic Records, where they’d scored two hits with their first two singles, including this classic.